It was the beginning of 1970s. Ponkunnam Varkey, the renowned Malayalam writer was the President of the Kerala Sahitya Academy. They were preparing to host the Ninth Congress Convention, a national event in Maharaja College ground, Kochi. Varkey asked Kshemavathy whether she could present a stage show for free. In return he promised publicity. She agreed but wanted him to pay her orchestra. He kept his word - the print media highlighted both previews and reviews with photographs. Kalamandalam Kshemavathy, the Mohiniattam dancer was born out of the mega event. The rest is history. "My very first lucky break, God's grace..." Yes, after that there was no turning back. It was followed by an invitation to World Youth Festival held in Berlin in 1973. The magic touch of Ponkunnam Varkey boosted the artiste to the international cultural horizon. Even now, after more than three decades, the trips to international venues continue. The only difference is earlier it was solo, now it is in group presentations. "I began for personal glory; now it is service for an art form. Life has come to a full circle. I fulfill my duties." Kshemavathy living in her hometown Thrissur, Kerala, is a revered Guru, honored by governments and cultural forums. Yet the journey began from humble beginnings. Way back in 1948, when this little girl was born to parents interested in theatre and music, they never thought a dancer would walk the ramparts of international stages. Love of dance was a god-given gift for her. 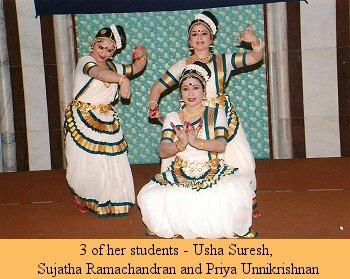 Local teachers, Kochukuttan asan, and a neighbour Hansa, taught her small pieces like Kaaliya Mardhanam. She was just 11 when the family heard of Kalamandalam enrolling students. She performed Kaaliya Mardhanam for the interview and Poet Vallathol, the founder of Kalamandalam, was pleased. For the next five years, Kalamandalam was the shaping spirit in her formative years. The institution in its nascent stage was under the tutelage of the poet. Thottathil Chinnammu amma, who was already old, scanned her memory for forgotten pieces of Mohiniattam. With the help of other asans, the poet tried hard to revive the dance form exclusive to Kerala. Kalamandalam Sathyabhama was one of the first student-turned teachers. Here Kshemavathy learned Bharatanatyam, the rudiments of Mohiniattam, and Kuchipudi. It was Thanjavur ARR Bhaskara Rao who introduced her to the nuances and subtleties of dance. Madras with its Sabha culture was the next venue where Kshemavathy performed and learned from noted masters. Bharatanatyam got perfected under Muthuswami Pillai, Chitra Visweswaran and Adyar K Lakshmanan while Vempatti Chinna Satyam molded the Kuchipudi dancer in her. It was a life of both teaching and learning. At home in Thrissur, she taught little children, and performed during seasons. And she used her earnings to learn more, and perform during the spell of monsoon in Kerala. Exposure enhanced her expertise and acclaim, as a talent to keep up the purity of three distinct dance forms. She performed Mohiniattam, Bharatanatyam and Kuchipudi on the same stage for a single show. Introduction to divergent styles and different choreographies made her bold to experiment and innovate. These Madras visits every year, is an ongoing feature of her life though its nature has changed over the years. Now she goes to Chennai to train a batch of senior dancers for performance, concentrating on choreography. Kshemavathy learned Kathakali from Kalamandalam Balasubramaniam and together they presented Damayanthi Hamsam to the sabhas in Madas. 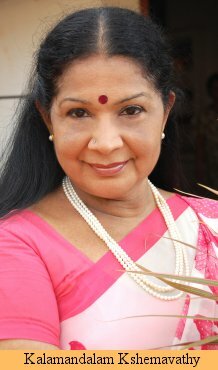 Poothana Moksham was another piece that she did in Kathakali. This stint with Kathakali gave a special nuance to her in evolving Mohiniattam. The first solo performance of Mohiniattam was for Vallathol centenary celebrations in Delhi. She took a poem of Vallathol and choreographed it for a national festival. It was a befitting attempt and an opportunity to innovate with an exclusive stamp of Kerala. In Asia 72, she performed Mohiniattam, folk forms of Kerala and Theyyam. By then, she became a noted artiste. And then came the Berlin break that took her to international heights. 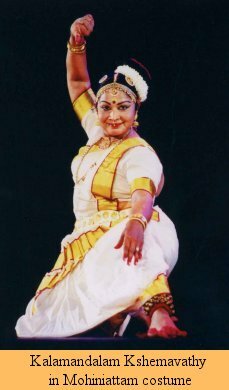 She visited Paris, Moscow, Tashkent as a cultural ambassador and Mohiniattam came to be known as one of the most graceful lasya dance forms of Kerala. By 1978, she was noted for her creativity and the courage to cast differently from traditional style of keeping Mohiniattam within the confines of sringaram and karunam. Malayalam poems gave the chance for experimentation, to introduce other rasas in sanchari bhava remaining within the traditional confines. Helsinki Asian Festival held in Finland in 1999 caused a steady stream of students from abroad. She has choreographed close to 100 poems; culled scenes from famous classics like Chintavistayaya Sita, Karuna, Leela by the great Kumaran asan; donned the male attire for Kuchela Vrtham; presented the poems of Cherusseri, Sugatha Kumari; choreographed even ghazals. Kshemavathy was just 29 when she received Kerala Sangeetha Nataka Academy Award for Bharatanatyam. The Kalamandalam Award for Mohiniattam came in 1993 and Kendriya Nataka Academy Award in 1999. Kerala State Government gave her the Nritya Natya Puraskar in 2008. She served the State Sangeetha Nataka Academy as an executive member for six years; remained as a member of the Panel of Judges, ICCR. A senior Fellowship from the Ministry of Human Resource enabled her to produce a research work of great value to the students of Mohiniattam. It is her famous students Krishna Kumar, Dr Neena Prasad, Aparna Marar, Vineetha Nedungadi et all, who carry on her legacy. Students keep coming in search of her, live in her house and learn in Gurukula tradition. The lasting love-affair with dance gifted her a belated marriage. Luckily, her late husband Pavithran, a well-known film director, supported her in her pursuits. 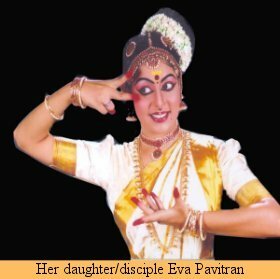 Her two daughters, Eva and Lakshmi are part of her troupe of dancers although they are part of the print media by way of occupation. Kshemavathy is an amicable person, contented in the pursuit of her life's passions. As the afternoon mellows, students haunt her dance class and rhythm of jingling bells resonates in the air.